Make no Mistake – VPX BANG® is not your stereotypical high sugar, life-sucking soda masquerading as an energy drink! High sugar drinks spike blood sugar producing metabolic mayhem causing you to crash harder than a test dummy into a brick wall. Power up with BANG’s potent brain & body-rocking fuel: Creatine, Caffeine, & BCAAs (Branched Chain Amino Acids). This is one energy drink you need to try! Too Much Caffeine May Cause Nervousness, Irritability, Sleeplessness, and Occasionally, Rapid Heartbeat. Not Recommended For Use By Individuals Under 18 Years Of Age. One Serving Of Bang Provides 300mg Of Caffeine Which Is More Than 2 Cups Of Coffee. CAUTION: Do Not Use This Product If You Are Pregnant Or Nursing. Do Not Consume This Product If You Are Taking Any Prescription Drug And/or Have Any Medical Condition. The User Of This Product Assumes All Liability If This Product Is Used In A Manner Not Consistent With Label Guidelines. This Product Contains Caffeine And Should Not Be Used With Any Other Caffeine Containing Products. This Product Is Intended For Use By Healthy Individuals Only. At The Time of Manufacturing. Some Vitamins Are Likely To Degrade. INGREDIENTS:Carbonated Water, Citric Acid Anhydrous, Natural And Artificial Flavors, Caffeine Anhydrous, Sodium Benzoate (Preserves Freshness), Potassium Citrate Monohydrate, Sucralose, L-Leucine, Potassium Phosphate Dibasic, Vitamin C (Ascorbic Acid), Calcium Chloride, Acesulfame Potassium, Potassium Sorbate (Preserves Freshness), Magnesium Chloride, Super Creatine (Creatine-L-Leucine [Creatine bonded ro L-Leucine]), L-Isoleucine, L-Valine, Calcium Disodium EDTA,Vitamin B3 (Niacinamide), CoQ10 (Coenzyme Q10), Vitamin B6 (Pyridoxine Hydrochloride), And Vitamin B12 (Methylcobalamin). Too much caffeine may cause nervousness, irritability, sleeplessness, and, occasionally, rapid heartbeat. Not recommended for use by children under 18 years of age. One serving of Bang provides 300 mg of caffeine which is more than three cups of coffee. Do not use this product if you are pregnant or nursing. Do not consume this product if you are taking any prescription drug and/or have any medical condition. The user of this product assumes all liability if this product is used in a manner not consistent with label guidelines. This product contains caffeine and should not be used with any other caffeine containing products. This product is intended for use by healthy individuals only. INGREDIENTS:Carbonated Water, Citric Acid Anhydrous, Natural Flavors, Caffeine Anhydrous, Sodium Benzoate (Preserves Freshness), Potassium Citrate Monohydrate, Sucralose, L-Leucine, Potassium Phosohate Dibasic, Vitamin C (Ascorbic Acid), Calcium Chloride, Acesulfame Potassium, Potassium Sorbate (Preserves Freshness), Acesulfame Potassium, Potassium Sorbate (Preserves Freshness), Super Creatine (Creatyl-L-Leucine [Creatine Bonded To L-Leucine]), L-Isoleucine, L-Valine, Calcium Chloride, Calcium Disodium, EDTA, Coq10 (Coenzyme Q10) Vitamin B3 (Niacinamide), Vitamin B6 (Pyridoxine Hydrochloride), And Vitamin B12 (Methylcobalamin). Not Intended For individuals Under The Age Of 18. Do Not Use This Product If You Are Pregnant Of Nursing. Do Not Consume This Product If You Are Taking Any Prescription Drug And/Or Have Any Medical Condition. This User Of This Product Assumes All Liability If This Product Is Used In A Manner Not Consistent With Label Guidelines. This Product Contains Caffeine And Should Not Be Used With Any Other Caffeine Containing Products. This Product Is Intended For Use By Healthy Individual Only. INGREDIENTS:Carbonated Water, Citric Acid Anhydrous, Natural And Artificial Flavors, Caffeine Anhydrous, Sodium Benzoate (Preserves Freshness), Potassium Citrate Monohydrate, Sucralean Brand Sucralose, L-Leucine, Potassium Phosphate Dibasic, Vitamin C (Ascorbic Acid), Calcium Chloride, Acesulfame Potassium, Potassium Sorbate (Preserves Freshness), Calcium Disodium EDTA, Magnesium Chloride, L-Isoleucine, L-Valine, Covalex (Covalently Bonded Creatine Glutamine Complex), Vitamin B3 (Niacinamide), CoQ10 (Coenzyme Q10), Vitamin B6 (Pyridoxine Hydrochloride), And Vitamin B12 (Methylcobalamin). Too much caffeine may cause nervousness, irritability, sleeplessness, and, occasionally, rapid heartbeat. Not recommended for use by children under 18 years of age. One serving of Bang provides 357 mg of caffeine which is more than three cups of coffee. Do not use this product if you are pregnant or nursing. Do not consume this product if you are taking any prescription drug and/or have any medical condition. The user of this product assumes all liability if this product is used in a manner not consistent with label guidelines. This product contains caffeine and should not be used with any other caffeine containing products. This product is intended for use by healthy individuals only. Too much caffeine may cause nervousness, irritability, sleeplessness, and, occasionally, rapid heartbeat. Not recommended for use by children under 18 years of age. One serving of BANG provides 357 mg of caffeine which is more than three cups of coffee. INGREDIENTS:Carbonated Water, Citric Acid anhydrous, Caffeine Anhydrous, Sodiumbenzonate (Preserves Freshness), Potassium Citrate Monohydrate, Sucralose, Natural Flavors, L-Leucine, Potassium Phosphate Dibasic, Vitamin C (Ascorbic Acid), Acesulfame Potassium, Potassium Sorbate (Preserves Freshness), Magnesium Chloride. SUPER CREATINE: (Creatyl-L-Leucine [Creatine Bonded to L-Leucine]), L-Isoleucine, L Valine, Calcium Chloride, Calcium Disodium EDTA, Vitamin B3 (Niacinamide), COQ10 (Coenzymeq10), Vitamin B6 (Pyridoxine Hydrochloride, And Vitamin B12 (Methylcobalamin). WARNING: Too Much Caffeine May Cause Nervousness, Irritability, Sleeplessness, and Occasionally Rapid Heartbeat. Not Recommended For Use By Individuals Under 18 Years Of Age. One Serving Of BANG Provides 300 Mg Of Caffeine Which Is More Than Two Cups Of Coffee. CAUTION: Do Not Use This Product If You Are Pregnant Or Nursing. Do Not Consume This Product If You Are Taking Any Prescription Drug and/or Have Any Medical Conditions. The User Of This Product Assumes All Liability If This Product Is Used In A Manner Not Consistent With Label Guidelines. This Product Contains Caffeine And Should Not Be Used With Any Other Caffeine Containing Products. This Product Is Intended For Use By Healthy Individuals Only. At The Time Of Manufacturing, Some Vitamins Are Likely To Degrade. Contains no Fruit juice. INGREDIENTS:Carbonated Water, Citric Acid, Natural Flavors, Caffeine Anhydrous, Sodiumbenzonate (Preserves Freshness), Potassium Citrate Monohydrate, Sucralose, L-Leucine, Potassium Phosphate Dibasic, Vitamin C (Ascorbic Acid), Acesulfame Potassium, Potassium Sorbate (Preserves Freshness), Magnesium Chloride. SUPER CREATINE: (Creatyl-L-Leucine [Creatine Bonded to L-Leucine]), L-Isoleucine, L Valine, Calcium Chloride, Calcium Disodium EDTA, Vitamin B3 (Niacinamide), COQ10 (Coenzymeq10), Vitamin B6 (Pyridoxine Hydrochloride, And Vitamin B12 (Methylcobalamin). Caution: Do not use this product if you are pregnant or nursing. Do not consume this product if you are taking any prescription drug and/or have any medical condition. The user of this product assumes all liability if this product is used in a manner not consistent with label guidelines. This product contains caffeine and should not be used with any other caffeine containing products. This product is intended for use by healthy individuals only. Warning: Too much caffeine may cause nervousness, irritability, sleeplessness, and occasionally rapid heartbeat. Not recommended for use by individuals under 18 years of age. One serving of BANG provides 300 mg of caffeine which is more than two cups of coffee. INGREDIENTS:Carbonated Water, Citric Acid Anhydrous, Natural And Artificial Flavors, Caffeine, Sodium Benzoate (Preserves Freshness), Potassium Citrate Monohydrate, Sucralose, Tartic Acid, L-Leucine, Potassium Phosphate Dibasic, Vitamin C (Ascorbic Acid), Acesulfame Potassium, Potassium Sorbate (Preserves Freshness), Magnesium Chloride, Super Creatine (Creatine-L-Leucine [Creatine Bonded To L-Leucine]), L-Isoleucine, L-Valine, Calcium Disodium EDTA,Vitamin B3 (Niacinamide), Coq10 (Coenzyme Q10), Vitamin B6 (Pyridoxine Hydrochloride), And Vitamin B12 (Methylcobalamin). Too Much Caffeine May Cause Nervousness, Irritability, Sleeplessness, and, Occasionally, Rapid Heartbeat. Not Recommended For Use By Individuals Under 18 Years Of Age. One Serving Of Bang Provides 300 Mg Of Caffeine Which Is More Than Three Cups Of Coffee. Do Not Use This Product If You Are Pregnant Or Nursing. Do Not Consume This Product If You Are Taking Any Prescription Drug And/or Have Any Medical Condition. The User Of This Product Assumes All Liability If This Product Is Used In A Manner Not Consistent With Label Guidelines. This Product Contains Caffeine And Should Not Be Used With Any Other Caffeine Containing Products. This Product Is Intended For Use By Healthy Individuals Only. INGREDIENTS:Carbonated Water, Citric Acid Anhydrous, Natural And Artificial Flavors, Caffeine Anhydrous, Sodium Benzoate (Preserves Freshness), Potassium Citrate Monohydrate, Sucralose, L-Leucine, Potassium Phosphate Dibasic, Vitamin C (Ascorbic Acid), Calcium Chloride, Acesulfame Potassium, Potassium Sorbate (Preserves Freshness), Calcium Disodium EDTA, Magnesium Chloride, Super Creatine (Creatyl-L-Leucine [Creatine Bonded To L-Leucine]), , L-Isoleucine, L-Valine, Vitamin B3 (Niacinamide), Coq10 (Coenzyme Q10), Vitamin B6 (Pyridoxine Hydrochloride), And Vitamin B12 (Methylcobalamin). Too Much Caffeine May Cause Nervousness, Irritability, Sleeplessness, and, Occasionally, Rapid Heartbeat. Not Recommended For Use By Children Under 18 Years Of Age. 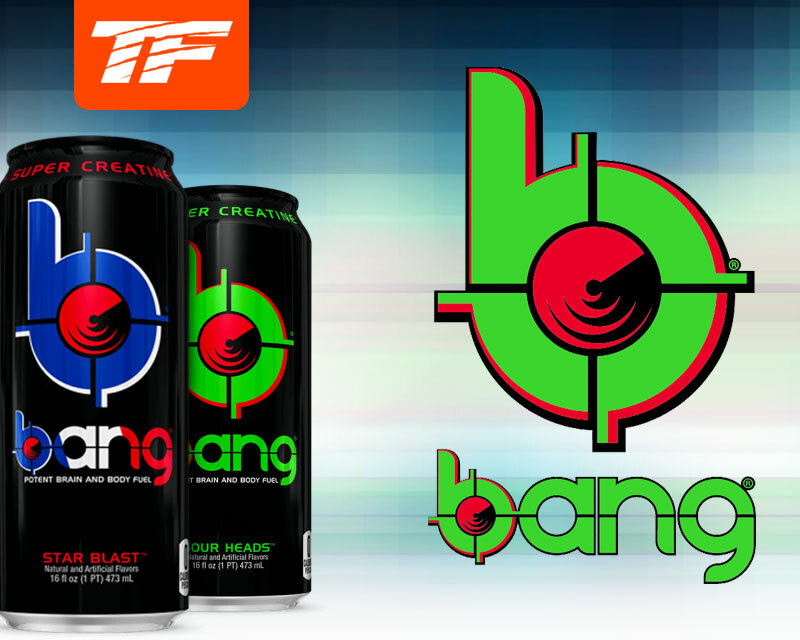 One Serving Of Bang Provides 300 Mg Of Caffeine Which Is More Than Two Cups Of Coffee. Caution: Do Not Use This Product If You Are Pregnant Or Nursing. Do Not Consume This Product If You Are Taking Any Prescription Drug And/or Have Any Medical Condition. The User Of This Product Assumes All Liability If This Product Is Used In A Manner Not Consistent With Label Guidelines. This Product Contains Caffeine And Should Not Be Used With Any Other Caffeine Containing Products. This Product Is Intended For Use By Healthy Individuals Only. INGREDIENTS:Carbonated Water, Citric Acid Anhydrous, Natural Flavors, Caffeine Anhydrous, Sodium Benzoate (Preserves Freshness), Potassium Citrate Monohydrate, Sucralose, L-Luecine, Potassium Phosphate, Dibasic, Vitamin C (Ascorbic Acid), Acesulfame Potassium, Potassium Sorbate (Preserves Freshness), Magnesium Chloride, SUPER CREATINE (Creatyl-L-Luecine [Creatine Bonded To L-Leucine]), L-Isoleucine, L-Valine, Calcium Chloride, Calcium Disodium EDTA, Vitamin B3 (Niacinamide), Coq10 (Coenzyme Q10), Vitamin B6 (Pyridoxine Hydrochloride), And Vitamin B12 (Methylcobalamin). INGREDIENTS:Carbonated Water, Citric Acid Anhydrous, Natural Flavors, Malic Acid, Caffeine Anhydrous, Sodium Benzoate (Preserves Freshness), Potassium Citrate Monohydrate, EAAs (L-Leucine, L-Isoleucine, L-Valine, L-Lysine, L-Threonine, L-Phenylalanine, L-Histidine, L-Methionine, L-Tryptophan), Sucralose, Potassium Phosphate Dibasic, Vitamin C (Ascorbic Acid), Potassium Sorbate (Preserves Freshness), Magnesium Chloride, Super Creatine (Creatyl-L-Leucine [Creatine Bonded To L-Leucine]), Calcium Chloride, Calcium Disodium, EDTA, Vitamin B3 (Niacinamide), Coq10 (Coenzyme Q10), Vitamin B6 (Pyridoxine Hydrochloride), And Vitamin B12 (Methylcobalamin). Not Intended For individuals Under The Age Of 18. Do Not Use This Product If You Are Pregnant Of Nursing. Do Not Consume This Product If You Are Taking Any Prescription Drug And/Or Have Any Medical Condition. This User Of This Product Assumes All Liability If This Product Is Used In A Manner Not Consistent With Label Guidelines. This Product Contains Caffeine And Should Not Be Used With Any Other Caffeine Containing Products. This Product Is Intended For Use By Healthy Individual Only. Warning: Too Much Caffeine May Cause Nervousness, Irritability, Sleeplessness, and Occasionally Rapid Heartbeat. Not Recommended For Use By Individuals Under 18 Years Of Age. One Serving Of Bang Provides 300mg If Caffeine Which Is More Than Two Cups Of Coffee. Copyright © 2019 Tiger Fitness.